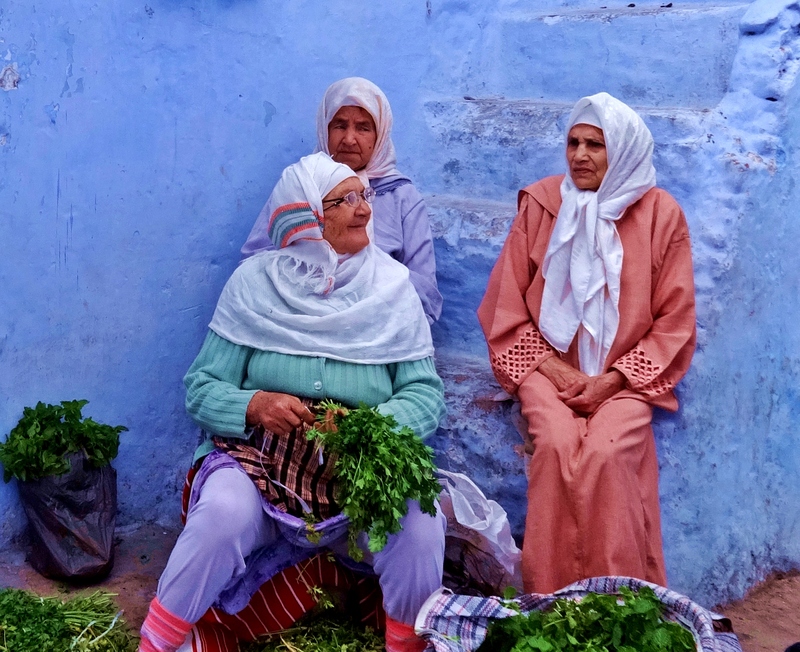 Women selling mint and coriander in the Medina at Chefchaouen. (Photo by Jude Farrar) Every so often one sails into the square with a tray full of toffee sized soaps wrapped in cellophane and dubiously perfumed. One for 10 dirham (€1). Buy one and you get three for 20 dr (€2). Do that and your friend gets a special offer. And so on . . . these women are a lot sharper than they look! When I was very young and lived in Portsmouth, me and mum would go to Charlotte Street market when she wasn’t at work or being a post-war housewife, and insult the market traders. She took me to the market to show me what would happen to me if I didn’t work hard at school. Mum worked at Marshall’s and at Woolworth’s and thought herself a cut above stall holders. “I wouldn’t be so thick with them” she would say, which I’ve worked out means that she wouldn’t help them cheat her. She was very sharp, loudly pointing out to me in my push chair, that the brilliant display on their stall was not what you got when you bought the fruit. You got the “pecked stuff” behind the counter. She would insist on the trader dismantling his display, although for all her bluster I can never recall her asking for a reduction in the price. She would feel demeaned. If she was buying something big like a ‘fridge and she had cash though, she would expect a bit off. Taking the moral high ground and striking a threatening pose was enough to ensure that you got value for money in weight or quality or both and that the trader would be less likely to cheat you. If you returned to the same trader regularly, you could expect him to give you a special deal – “Ah Mrs Perry! I have something here you might like – kept some back for you!” and so on. It was up to the trader to add value to the transaction and keep his customer. As I got older, if I came back from the market with a “Rolex” watch powered by an elderly cockroach that expired in twenty-four hours, or a bag of overripe fruit that would yield under the weight of mother’s finger, she would look me in the eye and say “He saw you coming”. Markets haven’t changed much since then, though there has never been a custom in English food markets for the buyer to try to haggle down the price of the goods. Can you imagine going to the poncy London Borough market today and saying ” A hand-crafted Cornish pasty with slivers of Dexter topside, small-diced French fingerling potatoes and “hand-shaved” Kentish swede for eight quid? I’ll give you two, and think yerself lucky!” I don’t think so. The great British car boot and the old flea markets on the other hand, now sadly “cleaned up” by the general gentrification of the inner cities can still be still great theatres of British barter. My wife Judy is obsessed, and has hauled me along to them for decades saying “you never know!” And she’s quite right. I once went to a car boot looking for a second-hand cello bow and a 1960’s retro coffee grinder. I found both and knocked each one down for a fiver, on the first stall I came to. My friend, my name is Ali, and you must buy from me today because tomorrow I am gone. 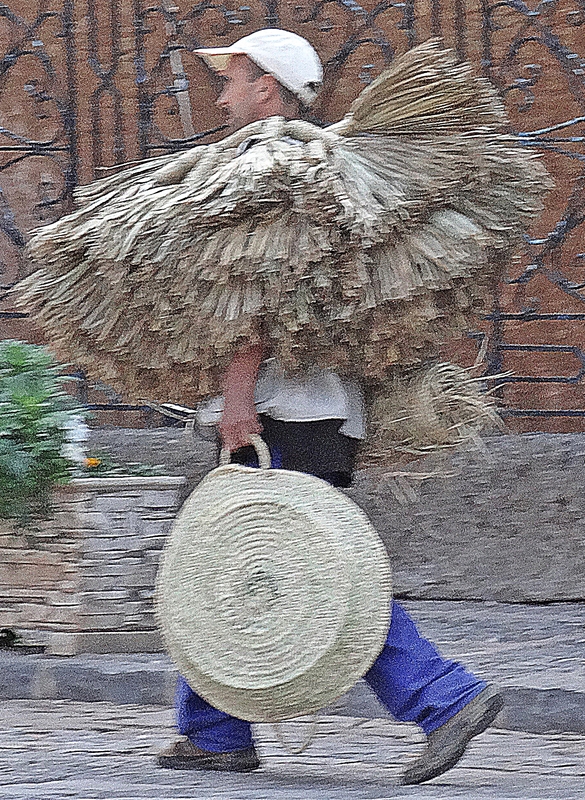 In the morning I leave for Fez, then to Marrakech and thence into the desert sands to emerge, God willing, but when? Take a photograph my friend as a token, and buy today. For we may never meet again . 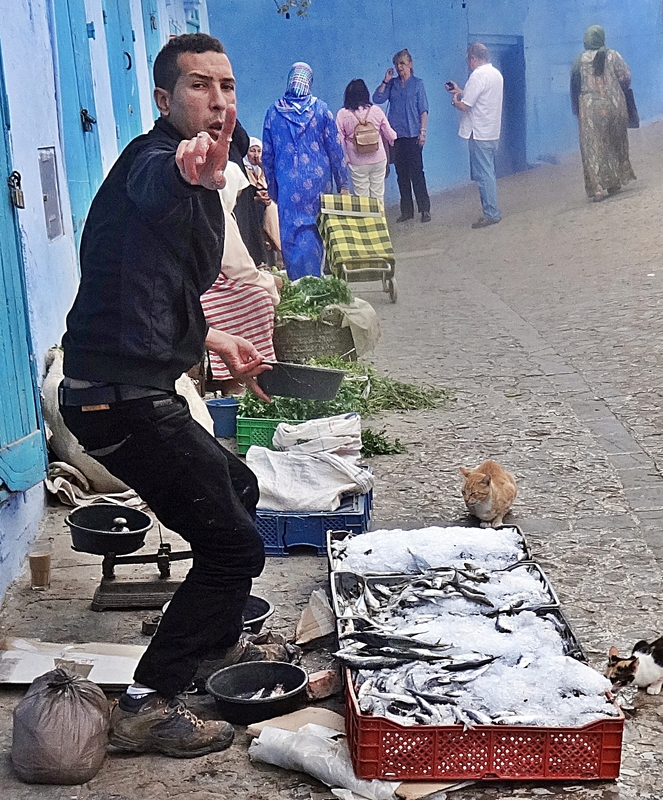 So why are Brits so gauche and unconfident when it comes to bargaining and buying in a Moroccan Souk (arabic expression meaning “the market neighbourhood)? When I talk to friends they seem worried about “hassle” and many otherwise adventurous tourists are put off by “hassle”, but surely “hassle” is really only cultural difference? In the mother country we Brits are “hassled” day and night waking and sleeping, to buy things we neither want nor need. 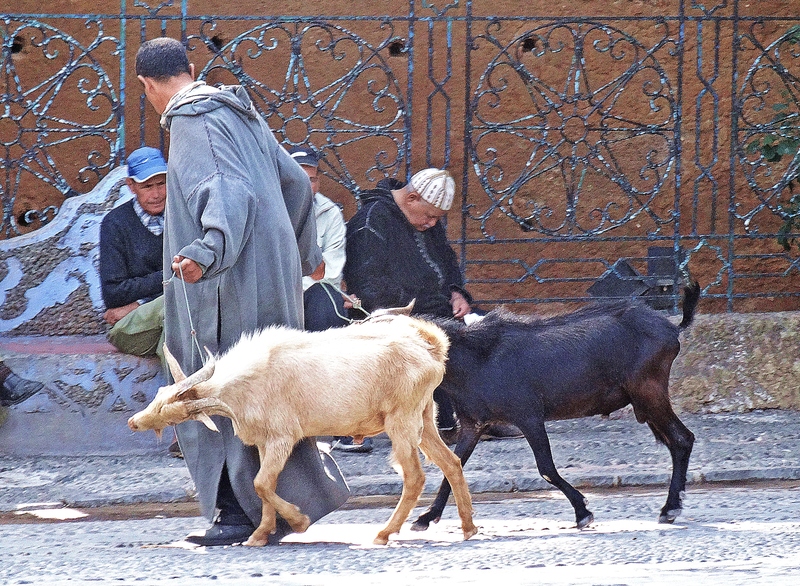 There is hassle on billboards, radio, television to buy buy buy – much more violently than any Moroccan street trader who invites you into his shop. In our country “hassle” doesn’t stop at the street either. It comes right into our living rooms and bedrooms. At the moment I am watching an advert for biotic (or is it bionic?) yoghurt. Five beautiful women of a certain age are discussing how they pass wind while enjoying a morning coffee in one of their kitchens . I begin to yearn to join that happy band, or at least to transform my kitchen into an ideal, cosy, fart free idyll by the simple purchase of a moderately priced dairy product. Hassle. I am endlessly slapped in the face by the orange and red plastic of hamburger joints – colours that make me drool for a slab of minced beef like an experimental dog. I’m not offended by this slurry of adverts because it’s normal life. We are hassled en mass. It is normal and ordinary, we buy and sell like mad things and that’s why we are richer than Moroccans. I don’t know what a Moroccan market trader would make of it though. One difference is that for us shopping is a literary experience. The prices are all written down and we like to read them and read the product description. Shopping is also private. We have an internal private discussion with ourselves about whether to buy without the shop keeper interrupting. So when that market trader comes up to me in the Souk and makes me an offer I can’t refuse I feel “hassled”. Of course it isn’t hassle! Why shouldn’t I accept an invitation to go into a shop to drink green tea? Or into someone’s brother’s shop that just happens to be on the way to where I actually wanted to go? What’s wrong with meeting a young man’s mother, who is in fact a virgin? Well perhaps not . .
No photos! What do you want? Here is a man, there is fish. What more to say? 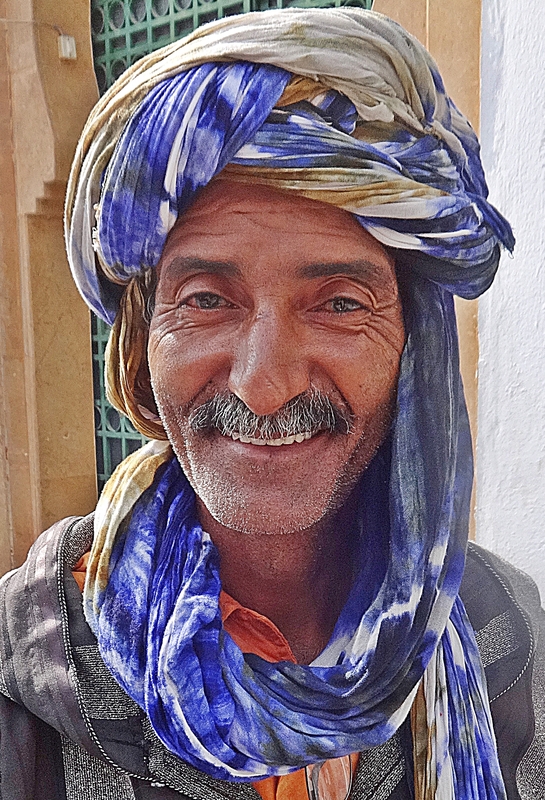 I lost my fear of being sold into white slavery when I turned sixty, so here are my tips for surviving the Souk. My first tip is to SMILE. I don’t say this as an expert in smiling. My mother used to say “For God’s sake smile! It’ll change your life!” I didn’t and it didn’t. Mum was not renowned for her smile either so perhaps it’s genetic. When I was in the Navy I was called to the captain’s cabin to be told that my face was bad for morale. So before I go a haggling I practice smiling in front of the mirror. Always smile when you are saying “No”. It eases the pain for both parties. Being offended is part of the salesman’s tool kit so don’t offend by expressions of irritation or tightness. Ideally, come across as a fruity old buffer who loves everyone and agrees with everything. If someone invites you down a side alley, smile wave and say something like “Of course dear heart!” as you walk in the opposite direction. Agree that the rug is beautiful, the only one of its kind, is made by a co-operative of starving women, and laugh charmingly when he asks you to buy. Secondly KNOW YOUR PITCH. At today’s rate a Moroccan Dirham (MAD) is worth about €0.90, so if you estimate ten Dirhams to the euro you will be about right. If a trader wants 500 Dirham for a rug, he is asking for about €50. The convention is to offer just over a half of the asking price and settle at between two-thirds and three-quarters. The more you are pressured the more you laugh. “I couldn’t possibly pay that much”, “I simply can’t afford that” is a much better gambit than. “How dare you! Are you trying to cheat me?” Remember you are on holiday. You are not some scum bag ex pat in Africa to rip off honest traders, neither are you a fool who comes to Africa to be bullied into paying more than he would in Spain. PAY FOR HELP. You won’t know where everything is and you’ll probably ask for directions or need other minor assistance from the locals. It’s a good idea to have some ten and twenty Dirham notes in your pocket. These represent one or two euros. If someone physically takes you where you want to go, does some research for you, enlists other local help, guides you through the crowd to the restaurant you are looking for, a small tip completes the transaction and usually ends the relationship. It’s an efficient way of getting round a strange place and your generosity doesn’t actually cost you much. Last of all,put yourself into the hands of God, even if you are an atheist. ITS NOT YOUR FAULT. You will win some and you will lose some. There is an element of luck and chance in the art of haggling, and you are never entirely in control. Enjoy your winnings and forgive yourself your mistakes. You can make a mistake just as easily in a conventional British store. When I think all that yoghurt I ate – and I still fart like a trooper!